Lúthien Tinúviel (ca. 4700 F.A.) - The daughter of King Thingol and one of the fairest of all female Elves in Middle-earth. 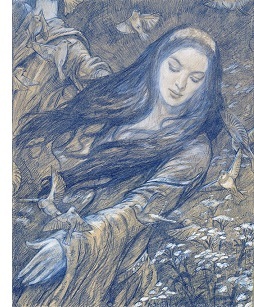 Despite the fact that she could have married about any male Elf she wanted, it was a Man who won her heart (see Beren & Lúthien), a relationship that changed everything.